Scenarios are mental projections of alternative futures. They are an act of imagination that are well suited to situations characterised by uncertainty. The aim is not to predict the most likely outcome, but to pre empt and prepare for a range of all possible ones. 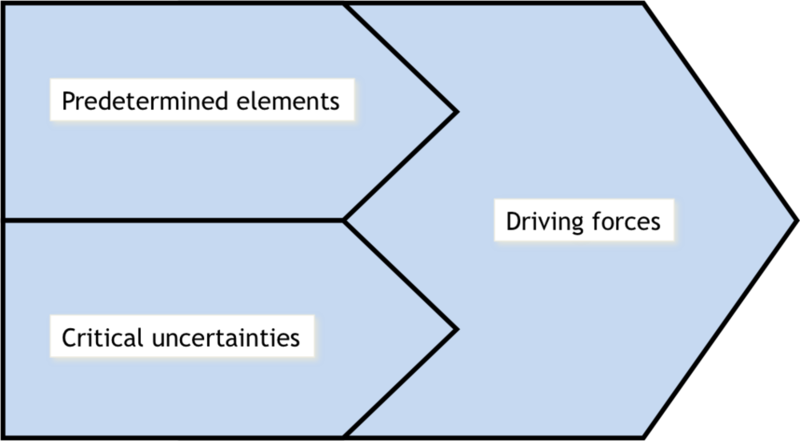 Constructing scenarios rests on an identification of "driving forces". These in turn rest on "predetermined elements" - events that are slow changing and likely to occur across all scenarios; and "critical uncertainties" - issues that lead to different paths. Once 3-5 unique scenarios are created the objective is to set clear signposts that will help identify whether they actually occur. This will put practitioners in a good position to deal with novelty and surprise. Get in touch if you are interested in a Workshop on Scenario Building. Wack, Pierre (1985) "Scenarios: Uncharted Waters Ahead." Harvard Business Review 63, 5: 73-89.